The last time Rubin talked about Android activations was back in June, when he said that 500,000 devices were being activated daily, and that they were seeing week-to-week activation growth of 4.4%. There’ve been about 25 weeks between the two tweets. Some quick math reveals that week-to-week growth since June hasn’t been anywhere close to the 4.4% Rubin was seeing. It’s now closer to 1.4%. Probably a bit of a stretch to say that Horace’s graph seems to be tapering off..
An increasingly frustrated lizard plays a game called Ant Crusher on an Android phone. Losing market share is like the 90’s rearing its ugly head all over again. Market share is meaningful in some contexts, like when you’re competing with a monopoly like Microsoft, or struggling to sell burgers in an environment dominated by cheap and cheerful franchisees. According to new numbers from the NPD Group, the iPhone 4S launch delay didn’t hurt Apple from a sales perspective. Over a year past launch, the iPhone 4 was the top selling phone in all of Q3 2011, with the two-year-old iPhone 3GS coming in at number two. Interestingly, the HTC EVO 4G, Motorola Droid 3, and Samsung Intensity II, hardly the latest and greatest devices, rounded out the top five. While some consumers may have waited for the latest iPhone to finally be released in Q4, it seems most were happy to continue buying Apple’s older wares. So, you’re saying that the iPhone is doing well – actually quite well. How does that relate to the linkbait title of your article (Apple has the top selling phones, but it’s still losing market share to Android)? The iPhone’s 21 percent growth trailed the overall smartphone market growth and its share of the market dropped to 15 percent. So comparing the iPhone 4S (one of 3 models Apple are selling) to the overall smartphone market is fair? Even if we accept that premise, how could you consider a growth rate of 21%, poor performance? Poor, compared to what? Oh, wait I remember now. Android market share. Though Apple may have dominated on an individual device level, Gartner’s Q3 2011 sales data shows Android pulling away from iOS. Android sales grew 194 percent year-over-year and the platform now accounts for more than 50 percent of all smartphones sold. The next decade will not be shaped by market share. The next decade will be shaped by dollars, just like the last decade and the decades before. Google’s business has never been to put phones in people’s hands, but that sure works a treat for putting advertising in front of eyeballs. Google’s business is advertising, so releasing an OS as open source seems like a worthwhile loss, if it generates business in other ways. This is pretty simple really, and a lesson HP is soon to learn, albeit the hard way. if anyone’s willing to throw massive piles of money at gaining marketshare that isn’t worth anywhere near what they spent to gain it, it’s Microsoft. Let’s not welcome back the 90’s, shall we? On another note, this is a perfect example of the criticism levelled at the verge by others, that there’s generally far more interesting debate in the comments than there is in the article itself. ★ But it's open, right? With Android, it seems to depend on the phone vendor, the specific model, the wireless carrier, the Android version itself, and whether Google sent the carrier an inflatable plastic food product as a token of its appreciation that week. Worse—and much to our chagrin—sometimes vendors make promises to customers before the sale that they don’t keep once you own the phone. I choose which version of software to run on my device, not my provider. I know the side of this issue I’m on. Just pitiful. “Whether you like Android or not, you will support that platform” sounds a little arrogant, but maybe that’s just me. But it got me thinking. Maybe “whether you like Android or not” is exactly wrong. I think maybe the biggest reason iOS has such strong developer support is that developers like iOS. They use and prefer iPhones and iPads personally, they like Cocoa, and they like the App Store. I tend to agree. I love the iPad, I love using it, I love creating things using it. I’m not even a developer (per se) but this thing makes me want to whip out Xcode and get started. Isn’t that weird? Android on the other hand, well… do we need to remind ourselves about the landscape again? 1. It’s complex – lots of different versions, screen sizes, input modes and hardware configurations. How are you meant to design a quality experience and maintain that for a thousand variants on the android model? Matt recently set out some arguments for and against maintaining support for the just the latest version of iOS, which has a grand total of 2 dominant OS versions, 3 handset options and 2 screen resolutions. That’s it. 3. It’s sluggish, laggy and generally slower than iOS or even Windows Mobile Deluxe Special Home ARM edition. Why would you torture yourself over this large volume, low margin, difficult to plan for and convoluted suite of devices? I can’t think of too many reasons. And to put it so bluntly – like it or not – just doesn’t make sense. On another note: does John Gruber ever sleep? I live in Sydney, which is hours behind/ahead of the US, and I often see updates from DF during the day. Has anyone else noticed this? 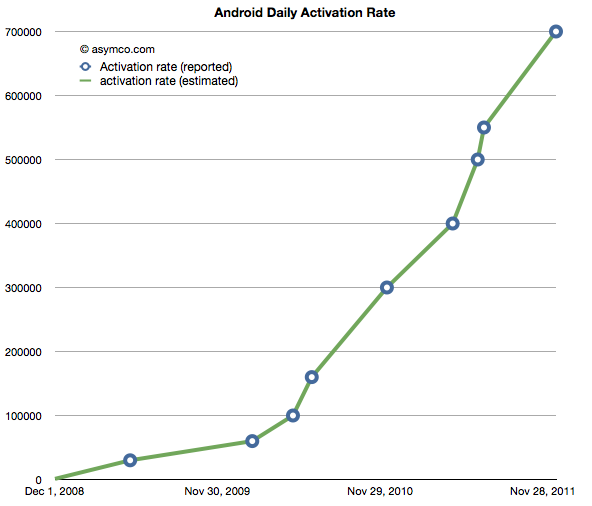 The growth of smartphones reached 38.5%. 50% by Q3 next year? Now is the time to be releasing that killer app, that great mobile web experience, those game changing interfaces and the next big thing. I hope you’re all hard at work..! Sebastiaan de With (author of the marvelous cocoia blog) recently made a small poster visualising the many flavours of android available in the US. Consumer choice is appallingly complex, with so many variables and trade-offs it’s hard to decide where you should draw the line. I’ve been considering a new Android phone recently, for a number of reasons but mainly to have a decent camera with me more often than not. I’ve found it increasingly frustrating! How are you meant to memorise names like Samsung Galaxy S™ II Epic™ 4G Touch or any of the many hundreds of equally forgettable variants on that? I’m all for flexibility, choice and competition in the — but this is ridiculous. It almost makes me yearn for the days when it was mainly cameras that had this much product choice variation, back when phones were a simple decision between Nokia, Motorola and… well that’s about it. Almost.